Nov. 21, 2018: As the district’s new K-8 literacy coach, Rosana Colliniates has dedicated her time to support and guide her fellow educators in achieving their goals as reading and writing teachers. Whether fostering greater independence among students or strengthening their writing skills, Colliniates has fully embraced her role. “I feel fortunate to be in this position and work with students across nine grade levels, as well as the fantastic teachers,” Colliniates said. 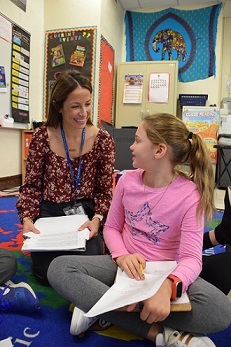 “We have such a dedicated, talented, and inspiring staff here at Bronxville. I’m appreciative that the teachers have welcomed me into their rooms and allowed me to share my experience and knowledge with them. Colliniates said her new role and access to every K-8 classroom has provided her with a greater understanding of how the reading and writing work at each grade level builds upon the work of the previous year. With respect to her goals for the rest of the year, Colliniates hopes to inspire students to continue to grow as readers and writers and to support teachers in reaching their goals as educators. 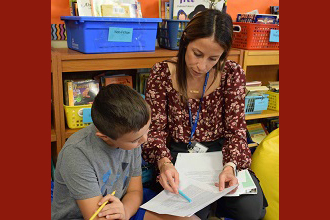 Pictured here: Rosana Colliniates, The Bronxville School’s new K-8 literacy coach, helps students strengthen their writing skills.